9x12, xl + 146 pp. 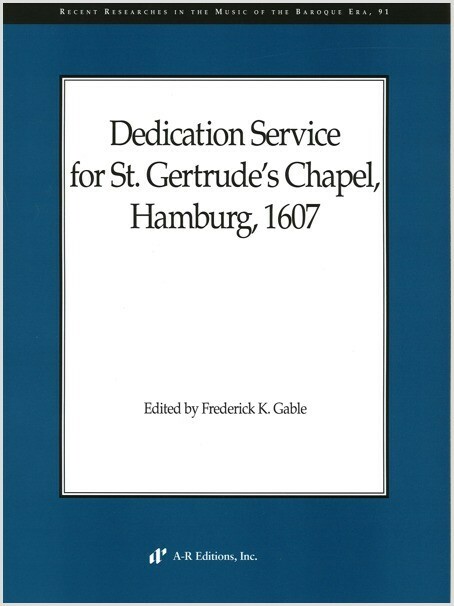 The edition reconstructs the festival Lutheran service dedicating St. Gertrude's Chapel in Hamburg on 16 April 1607, based on a firsthand description of the music and its performance provided by the presiding pastor in a preface to his published sermon. Supplemented by information from musical, pictorial, liturgical, and theological sources, the detailed account makes possible a plausible reconstruction of the full liturgical context for this historical event. The service included impressive double-choir works, a triple-choir motet by Jacob Handl, and the quadruple-choir German Te Deum setting by Hieronymus Praetorius. Antedating the better-known descriptions of musical practices by Michael Praetorius and Heinrich Schütz, the sermon account documents northern German use and placement of singers, instruments, and organs in polychoral music. In the introduction, the editor describes the chapel's suitability for the music's performance and offers advice on pronunciation, tempo, singing style for chant, organ types and registrations, vocal style, and performance alternatives.